During my recent trip to NYC I spent the snowy morning dubbed by the media as 'snowmageddon' in the warm cocoa company of Frank J Oteri from American Music Center, recording an interview for their New Music Box site. The interview features extracts of Gumboots, A Bird in Your Ear and Groanbox and Frank offers a (very flattering) take on my career state-side in the accompanying article. Giora Feidman and members of the Gershwin String Quartet in the studio in Germany, recording a new CD which includes some arrangements I did for them. This will be my first commercially released CD. 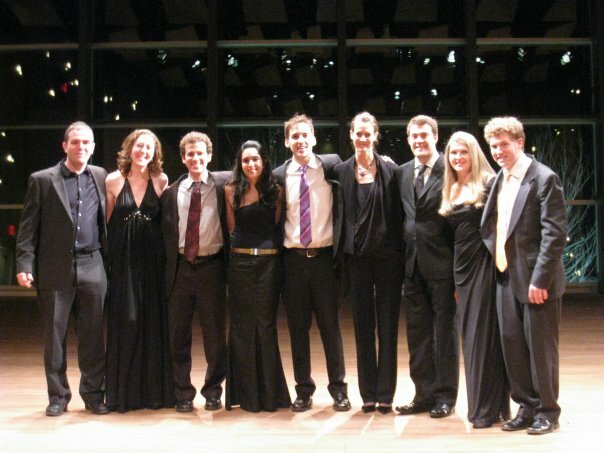 Metropolis Ensemble performing David Bruce's arrangement of 'If ye love me' by Thomas Tallis at Sunday's concert. Many congratulations to Metropolis Ensemble on garnering their first New York Times review for Sunday's Benefit concert and on raising over $6500 for Partners in Health, a nonprofit organization that provides medical care in Haiti. 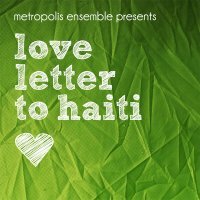 My friends at Metropolis Ensemble are pulling out all the stops to organise a fantastic Valentine's Day concert in aid of Haiti (Partners In Health), at Le Poisson Rouge this Sunday, Feb 14th 7pm. 20+ of New York's finest young classical musicians will be playing a whole range of music, including harpist Bridget Kibbey performing a movement from Caja de Musica. At conductor Andrew Cyr's request, I've also made a brand new arrangement to close the concert, of Tallis's gorgeous If Ye Love Me featuring all the performers who are coming. The text speaks of both love and comfort and I can think of little more comforting than an amazing collection of musicians getting together to give a bit of love back to the world. Ensemble ACJW has the most amazing collection of the nicest people and the finest musicians around. I had a great time on my residency at Skidmore with them, and then clarinettist Sarah Beaty and the ACJW quartet topped it all off by giving a really remarkable performance of Gumboots on Friday. The first part in particular sounded spectacular in the fine new Zankel Hall, and I'm sure it's only going to grow and be even better in both the forthcoming concert at Weill Hall on Tuesday (details here N.B. 7.30pm start), and at performances in Europe later in the year. And here's a very cool promotional video that Carnegie Hall organised for my concert on Tuesday at Weill Hall, featuring shots of us rehearsing the piece up in Skidmore College. We're up in Skidmore College, Saratoga in upstate New York for a performance of Gumboots tomorrow night with the fabulous players of Carnegie's ACJW. Today we had our first rehearsal in the amazing new Arthur Zankel Hall here and the results are stunning - a beautiful hall and a rich, resonant acoustic. We have the tremendous privilege and honour of giving the first ever concert in the hall.